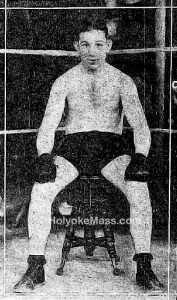 Meyer Cohen, [recent boxing hero among frequenters of the game at Holyoke, engages in the most important bout of his career tomorrow night at the Valley Arena, Holyoke. He is slated to go 10 rounds with Al Mello, at 150 pounds. Mello is the welterweight champion of New England, but of course this bout does not concern his class title. The club announced last night that the advance sale indicated a sell-out. The show will start promptly at 8:15. Five bouts are on the program. Al Mello and Meyer Cohen, 10 rounds at 150 pounds. Eddie David of Boston and Jack Catkish of Pittsburg, 8, at 147. Joe Andresano of Boston and Jack Horner of St. Louis, 8 at 144. Tommy Dunn of Holyoke and Kid Boston of Fall River, 6, at 130. Jackie Duffy of Ludlow and George Galanti of Brightwood, 4, at 117.Interest in the Mello-Cohen duel is high. Cochen who has been enjoying a winning streak is a powerfully built walloper, a fellow who hits hard and often, and one who can shake of stiff drives. Cohen has faced some tough birds but he has never met one so skillful as Mello. The New England title-holder has established himself as a puncher and as a very wise ringman, and of course is the favorite to beat the local idol. However, Cohen’s well-wishers are numerous and some of them even think Meyer can slow up the champion. In any case it looks like lively 30 minutes of battling, for Cohen appears to be able to take the punches of demon hitters. It has been said that if Cohen beats Mello he will be nominated for a semifinal at Madison Square Garden, and it can be added that anybody who beats Mello should be entitled to a job at a Garden show. Mello has never performed in this vicinity, but he comes as no stranger. What he did to Eddie Shevlin and what he has done to other welters has not been forgotten by local fans. 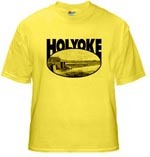 however, they are confident the Holyoke boy can and will make a good showing against the best man he has faced thus far. The two eight-round bouts promise action. In one, Jack Catkish, sparring partner of Jack Zivic, meets Eddie Davis, sparring partner of Al Mello and at the welter limit. In the other Jack Horner of St. Louis who has been giving a good account of himself in this section will meet Johnny Andresano of Boston. 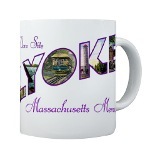 Tommy Dunn of Holyoke and Kid Boston are expected to furnish six fast rounds. George Galanti of the Brightwood Boys Club, who won the first bout of his profession career a fortnight ago, will travel four rounds or fewer with Jack Duffy of Ludlow. It is expected that the new ventilation scheme will be in working order. This means that smokers may perform without inconveniencing anybody save fellows who lend matches.